Social innovation as a field of practice continues to flourish and expand. Yet few have explored the roles, governance, and consequences of innovation and scaling in social enterprises. An overoptimistic and often naïve discourse about innovation may create unintended negative consequences for organizations. It might even hinder them in helping the people and communities they serve. Building on a decade-long research project studying social enterprises, we hope to offer a fresh and realistic look at how innovation and scaling enable social enterprises to create impact. We hope to strengthen understanding of the roles of innovation and scaling, to expose the potential but also the limits of innovation for creating impact, and to propose a number of practical frameworks that support decision making and long-term strategizing in social enterprises. First, let’s clarify some key terms. What do we mean by social enterprises, by innovation, and by scaling? In this book, we use the term social enterprises to refer to established organizations that enact a primary objective of catering to important social and environmental problems of disadvantaged people and communities. They often focus on problems that are not effectively addressed by public sectors or businesses, and they provide products, services, or interventions by working with and also on behalf of their beneficiaries. These organizations come in a variety of different legal structures and sources of capital. Some social enterprises generate profits; others use external funds to cover costs. Our use of the term social enterprise thus integrates a wide set of organizations in the social and development sectors. Our perspective on innovation positions it as a process by which organizations create and develop ideas under conditions of uncertainty. Innovations generate uncertain future outcomes. If successful, innovations create new products, services, or interventions that have potential for positive impact. The term scaling refers to actions that use established products, services, or interventions to serve more people better. Scaling creates predictable positive impact today. Numerous field visits, interviews, workshops, and active discussions with various stakeholders in the field of social innovation have led us to realize that productive decisions about innovation and scaling in the social sector necessitate a much more strategic organizational perspective than the one we typically encounter. We hope that our readers will treat this book as a joint learning project. It provides a number of tools, frameworks, and case studies that will enable readers to reflect deeply on similarities to and differences from their own organizations or organizations they are interested in. Working with this book is an investment in understanding and learning that pays off in informed decision making about whether, when, and how to innovate for impact. Making smart long-term decisions about innovation and scaling is crucial for organizations, their funders, and their supporters in the form of consultants, researchers, or observers. The book also supports educators interested in understanding innovation and scaling as part of organizational efforts to create impact. More than fifteen years ago we embarked on a research journey to understand how social enterprises dealt with stubborn social and environmental problems and catered to basic human needs by developing novel solutions. What triggered our interest as scholars and educators in strategic management was how these organizations created value. Value creation in social enterprises goes beyond generating financial returns, the principal measure of value creation in business. It explicitly integrates the creation of positive impacts on the lives of the individuals and the communities they serve. We found that the most inspiring and novel solutions were enacted by organizations from the Global South. These social enterprises engaged deeply and on an eye-to-eye level with the people and communities they served. They generated unusual combinations of resources and capabilities to attack persistent needs and pressing problems. They deployed different organizational forms and structures that included nongovernmental organizations (NGOs), not-for-profit enterprises, and for-profit firms. They created hybrid arrangements by combining and integrating these forms in novel ways. What impressed us most was their determination and commitment to making a real difference in the lives of the poor or alleviating environmental problems over long periods of time. To us, these social entreprises and the people that created these organizations appeared tremendously innovative. A nascent but vibrant community that formed around the topic of social entrepreneurship agreed with our view. For example, Ashoka, an organization that supports and promotes social entrepreneurs, states that “social entrepreneurs are individuals with innovative solutions to society’s most pressing social problems.”1 The Economist expressed a similar view: “A social entrepreneur is, in essence, someone who develops an innovative answer to a social problem.”2 In the spring of 2004, we embarked on our first field trip to Bangladesh to examine more diligently how these organizations managed to be so innovative. We learned that the local realities in which they operated did not match our romantic and somewhat glamorized image about “social entrepreneurship.” The organizations had tremendous impact on the constituencies they served. But innovation played a relatively minor (although very specific) role in creating that impact. Filling the gap between what we think these organizations do and how they really do it is the main motivation for this book. We want to provide space not just for the usual success stories but for reflections on failures, unintended consequences, and false assumptions. We strongly believe that a more realistic depiction is a solid foundation for making better decisions about innovation and scaling to achieve what we all aspire to: supporting organizations to provide disadvantaged people and communities with solutions for their fundamental problems and to create fruitful spaces for development. Social innovation as a growing field of practice involves social entrepreneurs and their organizations, impact investors and foundations supporting them, companies that partner with them, and governments that rely on them. We aim to reveal, challenge, and go beyond commonly held assumptions about social innovation on a number of topics, as discussed in the following subsections. It is popular to reduce social innovation to the actions of individuals and consider social entrepreneurs as “the new heroes”3 and “change makers” who singlehandedly change the world.4 Instead, we focus on the organizations that these entrepreneurs built. Organizations comprise not only visionary leaders but also their followers. Most people in social enterprises are not social entrepreneurs but regular staff who care about having a job. The inner workings of social enterprises are often treated as a “black box” in social innovation discourse. Yet they are where innovation and impact creation happen. How innovation and scaling are done in established social enterprises is the central lens of this book. Innovation is considered the key to business success. In today’s hypercompetitive markets, success or even survival without innovation seems unlikely. Because innovation is so strongly associated with business success, the term has been eagerly adopted by the social sector, which addresses problems related to poverty and development. Innovation is good, the more the better! The role of innovation in generating impact is hardly ever questioned. Eric Schmidt, the former CEO of Google, says that the company does not care about incremental ideas that allow them to be 10 percent better.6 They care about radically innovative ideas that allow them to be ten times better to cater to and to create a myriad of dynamically evolving needs and wants of relatively wealthy customers. Developing countries suffer much greater and more persistent needs of poor people and communities, and they generally have much lower levels of competition and available resources than developed countries. Is investing in the improvement and scaling of existing products, services, and interventions potentially more urgent than innovating different ones? Investing in being 10 percent better may not count for much for Google or its customers but may make a real difference for the poor. We assert that innovation per se does not create impact. Innovation generates the potential for impact creation. Scaling creates impact from innovation. Another central message of this book is, “If you don’t know how to scale, don’t innovate!” Innovation and scaling are often treated as separate ways to create impact. This division is unproductive. The two processes need to be integrated. We offer frameworks and conceptual tools for systematically assessing how to productively integrate innovation and scaling for impact. Innovation often fails and has uncertain outcomes. In modern markets with fluid capital, knowledge, and labor the innovation failure of one business is a positive opportunity for a competing business. Stakeholders are protected from negative effects of failed innovation, for example through diversification, legal mechanisms, and insurance and welfare systems. The dynamic is very different for organizations operating in developing countries where the cost of innovation failure may be significant. In poor communities the legacy effects of failed innovations may be severe in the long run. For example, the introduction of a novel service provided free by a development organization may create the expectation that other services will also be provided free. This unintended consequence of innovation persists even if the innovation has failed. Subsequent organizations may find it difficult to introduce services in an economically sustainable way. Innovation failures of a single social enterprise may deprive whole communities of essential services for a long time because their needs are not targeted effectively by the public or private sectors. Poor people without any safety net may be extremely vulnerable to failed innovation, which affects them directly. This vulnerability provides a strong argument for a critical view of the potential of innovation in the social sector. The benefits from innovation may not always justify the associated risks. Any innovation efforts need to be made very productive. Innovation in the social sector is thus neither naturally legitimized by its potential benefits nor a necessity for competitive reasons, as it is for businesses. For that reason, we do not provide innovation recipes but explore how organizations potentially can innovate and grow at lower degrees of uncertainty and risk to improve the quality, predictability, and scale of their solutions. We replace an innovation logic with an impact-creation logic. Innovation is often associated with technical problems that can be solved with technical solutions. We differentiate between technical and relational problems and distinguish the different challenges that technical problems (dealing with economic resources, technology, and cognitive challenges) and relational problems (dealing with norms, traditions, politics, and power relations) present for innovation and scaling. Furthermore, case studies of four organizations (see Part II) remind us of the critical role that an organization’s identity—its core values, beliefs, and sense of mission—plays as it makes productive decisions about innovation and scaling. Here is a guide to the learning journey that we hope this book sets you on. In Chapter 1 we challenge widely held assumptions and the popular use of the word innovation. Even in experienced organizations, the term has ambiguous, unclear, and inconsistent meanings and uses. This is not a productive basis for decisions, learning, and supporting long-term efforts to create impact. We therefore explicitly link innovation to the objectives and potential for impact creation in organizations. Because our focus is on innovation in established organizations, we present a framework that clarifies the relation between innovation and the impact-creation logic of organizations. The term impact-creation logic refers to the ability of organizations to purposefully create impact by acting on accumulated knowledge in three important dimensions: the problem space that defines the needs that an organization targets in a particular environment, its mission and strategy, and its resources and capabilities. Innovation in that framework refers to creating and developing ideas that deal with uncertainties in some or all of these dimensions. Because innovation deploys organizational resources for uncertain future outcomes we propose that innovators keep an eye on six types of uncertainties. We explicitly distinguish innovation from scaling. We refer to scaling as activities that act on and improve already existing knowledge, processes, products, services, or interventions to serve more people better. Scaling creates more immediate and more predictable positive impact than innovation. This distinction between innovation and scaling has serious implications for decisions about allocating resources to either innovation or scaling. The frameworks in Chapter 1 provide a consistent terminology and an analytical perspective for comparing and for drawing important distinctions and insights from the four case studies in Part II. In Chapter 2 we further explore the important distinction between innovation and scaling. Building on Chapter 1, where innovation and scaling are treated as distinct sets of activities, this chapter explicitly links the two. Doing so generates a generic innovation process that consists of the creation and development of new ideas (innovation) and the subsequent operational delivery of the resulting products, services or interventions, their improvements, extensions, and growth (scaling) that generate impact. This perspective sensitizes readers for a critical distinction between innovation or scaling as two fundamentally different processes and innovation and scaling as two processes that are joined over time and fundamentally depend on each other. This distinction is an important and useful lens for evaluating our featured social enterprises’ long-term decisions about scaling and innovation and how this creates positive impact. A process view of innovation opens up an opportunity to diagnose innovation pathologies, unproductive innovations that waste scarce organizational resources. We develop a diagnostic tool that enables mapping innovation pathologies. An objective assessment of these pathologies supports decisions about how to make innovations more productive and how to integrate innovation and scaling into an organization’s long-term impact-creation logic. In Part II we dive deeply into four social enterprises. The case studies in Chapters 3 through 6 invite reflections on their particular approaches to innovation and scaling. They also illustrate the conceptual frameworks in Chapters 1 and 2 to emphasize distinct challenges to innovation and scaling, depending on the particular impact-creation logics of the organizations. The chapters also introduce the particular environment that defines the operating space of the social enterprises in this book: developing countries with many social and environmental problems. The cases give us a rich set of data to support a comparative analysis and let us draw conclusions and insights. We compromised between providing mere narratives and providing “raw” data. We have integrated many direct quotes by members and observers of the featured organizations into the case narratives. Their words let readers draw their own conclusions before reflecting on the more analytical Chapters 7 and 8. At the end of each case study we synthesize insights and important distinctions from each organization. We distinguish among four innovation archetypes that represent a distinct sequencing and purpose of innovation and scaling over the lifetime of an organization. Innovation archetypes enable organizations to think systematically and explicitly about how to integrate innovation and scaling over time and how this integration contributes to establishing and strengthening a distinct impact-creation logic. In Chapter 7 we compare the histories and the innovation archetypes of the four organizations in a systematic manner. We also show how impact-creation logics change over time and potentially become broader and deeper. This evolution has important implications for the relative innovation advantages of organizations that organizational decision makers and potential funders should explicitly consider. In Chapter 8 we reflect on a prominent feature that seems to define almost all of the most effective social enterprises we have studied: a deep engagement with local communities, a willingness to learn from them and to understand what makes them tick. This chapter therefore focuses on problem spaces, the ways in which needs and problems associated with poverty are embedded in local characteristics of their socioeconomic and political environment. We introduce a crucial distinction between two types of problem spaces, technical and relational problems. The factors that create and sustain important poverty-associated needs and problems of individuals and communities can be identified and mapped as a distinct problem space. This mapping approach is the basis for a diagnostic framework that organizations and their supporters can use to understand the implications of these factors for intervention design, for innovation, and for scaling. It guides the design of adequate measures and it helps establish more realistic expectations about the time required for translating interventions into beneficial outcomes. It is also a simple yet powerful tool for learning within and across organizations and geographic areas. This diagnostic tool facilitates innovation efforts where constant and systematic learning is crucial, as well as project evaluation and benchmarking efforts. The closing chapter summarizes and synthesizes our main findings and makes practical recommendations for how to use and to integrate the tools and frameworks presented in this book for other organizations. A central message is that productive innovation rarely comes from trying to make organizations more “innovative.” Rather, productive innovation is the result of investment in organizational infrastructure, and this often means innovating less. And, although routine work and small improvements to existing products, services, and interventions do not have the “sexiness factor” of innovations, organizations are well advised to resist the innovation hype and concentrate on building committed, productive organizations based around a clear, consistent, and well-developed impact-creation logic. Doing so requires patience, realism, and a willingness to invest in building and nurturing enduring organizations that develop their own unique character and approach to innovation and scaling for impact. Because we occasionally refer to our case studies in Chapters 1 and 2, a brief introduction to the organizations is in order. First we want to clarify the purpose of the case studies. We provide rich histories of two decades of each organization, from its founding until today. We integrate many direct quotes to give the organizations voice and to reduce our own biases and tendencies as researchers for selective editing and overinterpretation. By letting the organizations speak for themselves, we hope to encourage you to do your own analysis and interpretation of the cases before reflecting on the insights and conclusions that we draw from them. Comparing your own findings and impressions of the cases with our analyses and conclusions is a much more fruitful learning method than relying on our findings alone. Compare the differences and similarities between the featured organizations and their environments with your own. How do they think about the problems of innovation and scaling? How does your organization? A keen sense of contextual scope and boundary conditions facilitates generalizations from a few social enterprises to other organizations that are valid and therefore of practical use. 1. We wanted to provide sufficient variety in the missions and approaches of organizations to reveal the broad range of roles that innovation and scaling play in social enterprises, how the processes are enacted and with what consequences. 2. The organizations were founded in two developing countries, Bangladesh and India. Their location gives the book a particular lens that reduces effects introduced by country-specific differences. This also means that we need to be sensitive to these particularities when generalizing findings to other environments, especially to social enterprises operating in developed countries. 3. We had followed these organizations and had interacted with them on a number of occasions within and outside their operating environments for more than a decade. We felt that we had established trusting relationships with a number of people within and outside the four organizations, so that they were motivated to share facts and anecdotes about failures, false assumptions, and unintended consequences of innovations. 4. We had collected a broad set of data from these organizations as well as a number of external funders, supporters, and observers. This variety provided us with sufficiently deep accounts to reflect different perspectives of different observers over time, as well as an appreciation of the ongoing changes that defined their trajectories. Table I.1 compares salient facts of the organizations. Their case studies will be presented in Chapter 3 (Innovation as Learning: The Story of Gram Vikas), Chapter 4 (Innovation in Support of Scaling: The Story of Aravind), Chapter 5 (Innovating and Scaling for Transformative Impact: The Story of BRAC), and Chapter 6 (Innovation that Enables Diffusion: The Story of Waste Concern). 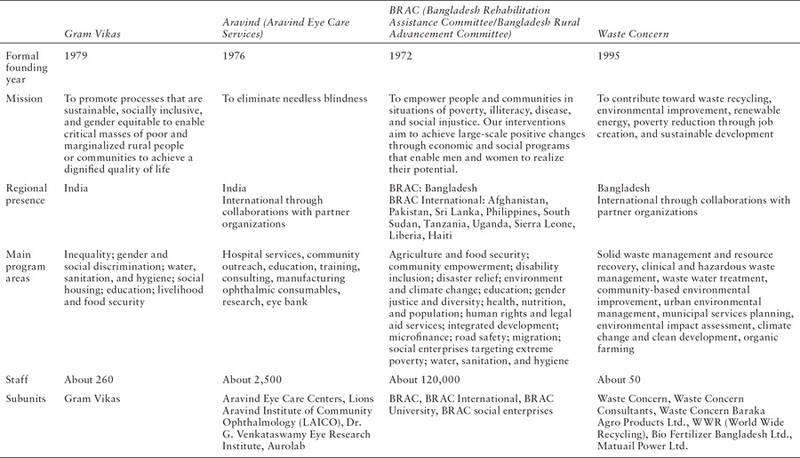 Table I.1 Brief summaries of the four organizations featured in this book (data from 2014). 1. Ashoka. “What is a social entrepreneur?” Retrieved on February 3, 2015, from www.ashoka.org/social_entrepreneur. 2. The Economist. “Social innovation: Let’s hear those ideas.” August 12, 2010. 3. PBS. “The new heroes.” Retrieved on July 25, 2015, from www.pbs.org/opb/thenewheroes. 4. Christian Science Monitor. “Bill Drayton sees a world where ‘everyone is a changemaker.’” Retrieved on July 20, 2015, from www.csmonitor.com/World/Making-a-difference/Change-Agent/2011/0516/Bill-Drayton-sees-a-world-where-everyone-is-a-changemaker. 5. Christian Seelos and Johanna Mair. 2012. “What determines the capacity for continuous innovation in social sector organizations?” PACS Report to the Rockefeller Foundation. Stanford, CA: Stanford University. 6. Eric Schmidt and Jonathan Rosenberg. 2014. How Google Works. New York: Grand Central Publishing.